Daily Grammar is a fun, convenient way to learn grammar. Daily Grammar simplifies complex grammar subjects into short, simple lessons. By practicing language rules, any person able to read will be able to master English grammar. 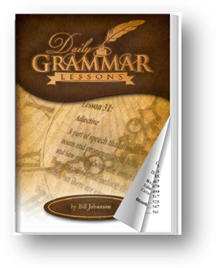 Over the years, Daily Grammar has received an overwhelmingly positive response; consequently, we have taken our grammar lessons and re-formatted them into a REAL eBook that we call a FlipBook. REAL as you can flip, search, navigate, and interact just like holding a book in your hands.You can also highlight text and add notes to any of the pages of FlipBook. We are excited to present this product and feel it will be an immense learning tool for people of all ages and learning levels. The Daily Grammar FlipBook consists of three parts: speech, sentence structure, and mechanics. For easier learning, the lessons have been grouped together and placed in chapters. A convenient index has been added to help readers locate specific grammar subjects. If you have any problems with the purchase, please contact dailygrammar_support@ebooksys.com. The Daily Grammar FlipBook is jointly created by Daily Grammar (www.dailygrammar.com) and E-Book Systems (www.ebooksys.com).